Please note DANCE LOVE LIFE GIVE occurred in past. 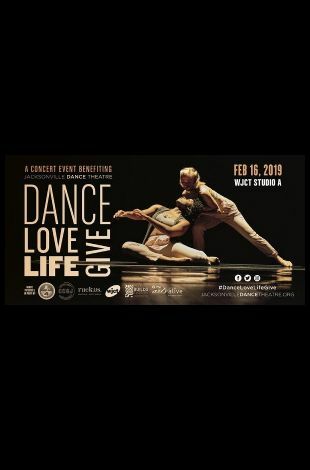 Jacksonville Dance Theatre (JDT), Jacksonville's own critically acclaimed professional modern dance company, presents DANCE LOVE LIFE GIVE a concert event benefiting JDT on Saturday, February 16, 2019 at 7:30 p.m. at WJCT Studio A in Downtown Jacksonville. 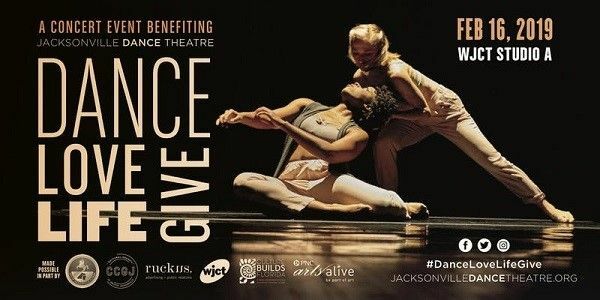 Join JDT's friends, founders, dancers, directors and board members for an evening of JDT performances followed by drinks, canaps, music, dancing and a special presentation honoring guest artist, MaryAnne Aycock.